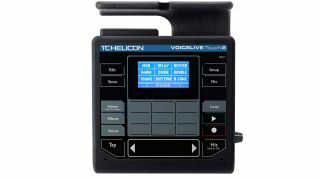 VoiceLive Touch 2 is the newest vocal processor from TC-Helicon. Pamper your vocals with effects, modulation, harmonies and more - or loop-record for insane creative control. All this comes either at the touch of the VoiceLive processor box, or - thanks to the new MP-76 microphone's four assignable buttons - from the very palm of your hand. The VoiceLive box itself features a raft of high-quality dedicated vocal effects, complete with a slider control to take the effect wherever you want it in real-time. TC-Helicon's VLOOP technology is also on-hand to get six tracks of loops, which you can, of course, treat with the onboard effects. Control over the hardware gets even easier with the release of the MP-76 microphone. Similar to the company's earlier MP-75 model but with more assignable buttons, tweaking the box can be done... outside the box, from anywhere on stage. The VoiceLive Touch 2 and MP-76 mic will be released as a bundle at the end of February. They'll cost £469/€599/$599. More information is available from the TC-Helicon website.